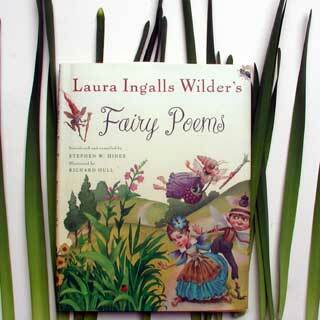 Laura Ingalls Wilder's Fairy Poems, Introduced and compiled by Stephan W. Hines and illustrated by Richard Hull. ISBN 0-385-32533-9. You may know the name, Laura Ingalls Wilder, as the author of the Little House on the Prairie. The inspiration for this work came from her journey in 1915 from her home in the Missouri Ozarks to San Francisco. Her daughter, whom she was visiting, wrote for the local newspaper and encouraged her mother's writing. The five fairy poems compiled in this book were originally written over a three month time. The imagery is vivid and poems are short so they are perfect reading before nap time or as a final thought before bedtime. Within Richard Hull's distinctive style, he has created some playful images for these poems. For example, a fairy pushing a snail up a leaf, a ladybug walking a caterpillar and a fairy peeking into a cracked and abandoned bird's egg. There is an illustration of a faerie wearing a birdhouse as a hat and she is hovering over an infant while painting freckles on it's cheeks so the baby can blend in with a bouquet of Tiger Lilies. There is a faerie riding a snail who is toting a trailer in the shape of a fish. An elf mounted on a hare leaping over a garden. To describe the illustrations as imaginative is to state the obvious. Laura Ingalls Wilder's Fairy Poems is a short 39 pages but is overflowing with new written and visual thoughts that it will keep your attention for a long time. Faerie Rings is registered trademarks of Lynette MIller.